Jus Cultura (JC), the Literary, Debating and Quizzing Society at National Law Institute University, Bhopal is organizing Fourth NLIU Debate. The format of the Fourth NLIU Debate shall be 3-on-3 Asians Parliamentarywhile adhering to the (N=1) rule for adjudicators i.e. each team must be accompanied by one adjudicator. In the spirit of ensuring the highest quality teams, crossinstitutional teams are permitted. However, all the speakers participating in the Debate must necessarily be enrolled in an academic institution at the time of participation (participants pursuing Master’s and other post-graduate courses are welcome). Please note that the aforementioned restriction shall not be applicable in the case of adjudicators. This is being done so as to provide teams with the best possible adjudication during the tournament. In order to ensure a high standard of adjudication in the tournament, organizers are going to be giving out adjudication subsidies to a maximum of five adjudicators. The subsidies cover train travel (AC-3 Tier) to and from Bhopal and registration fees up to a maximum amount of Rs. 2,200. Subsidized adjudicators remain competitive for the Best Adjudicator prize. If you're interested in applying, then please send us an email along with your debating CV at nliudebate@gmail.com. The application process is now open. Don’t forget to specify the same while filling out registration form on the website. Each debating match will consist of two teams; one to propose the motion and one to oppose it. The team proposing may be known as ‘the Proposition’, ‘the Affirmative’ or ‘the Government’. The team opposing may be known as ‘the Opposition’ or ‘the Negative’. Teams will be designated as the Proposition or the Opposition for each round of the Competition. Each debate shall be adjudicated upon by a panel comprising of an odd number of adjudicators. One of these shall be designated as Chairperson. In the Preliminary Rounds, a debate may be adjudicated by a single experienced adjudicator. Each debate shall be timed by a timekeeper. In the absence of a timekeeper, a member of the adjudication panel will time the speeches. Speakers not ‘holding the floor’ may not rise during a speech unless it is to offer a ‘Point of Information’ (see Part Five of this document). Speakers doing so, or considered to be heckling, barracking or whose behaviour is interfering with the acceptable course of a debate will be declared ‘out of order’ or will be ‘called to order’ by the Chairperson. The motions for each round will reflect a specific and well-known theme, and each round of the Competition will comprise of three choices of motions. On release of the motions, both teams to a match-up shall rank the three motions on the basis of preference, where one stands for most desired motion and three stands for the least desired motion. The third option of both teams is immediately dropped. If there remains a clear favourite, that motion is directly selected. In case of a tie between the two remaining motions, the motion for that round and match-up will be decided on the basis of a coin toss. It is the responsibility of the Chairperson to oversee the selection of the motion. The venue and match-ups will be announced before the motions are released. After the release of the motions the teams must proceed to the venue. The teams are allowed 25 minutes of preparation time starting from the release of the motion up till the commencement of the debate or as notified immediately before the release the motions of the debate of the round. The Affirmative have the right to prepare in the room (venue). Teams are allowed to use printed or hand prepared materials during the preparation period. Teams shall not use electronic media or electronic storage or retrieval devices after motions have been released. Printed or hand prepared materials may also be used during a debate, but printed materials may not be used by a speaker holding the floor. The speaker may use hand-written notes while holding the floor. Teams shall not consult coaches, trainers, friends, observers or any other individual (other than their team mates) during the preparation period or during the debate, in order to obtain assistance to prepare for the debate. Teams failing to arrive in time for the debate shall be deemed to have forfeited that particular round. Teams failing to arrive in time for more than two rounds including the knock-out rounds shall be deemed to have forfeited the tournament. It is the duty of the timekeeper, or of a panel member or Chair (in absence of a timekeeper), to time all the speeches in each round. The timing of each speech starts at the moment, the member begins speaking. Once the prescribed time has elapsed, speakers have a 20-second ‘grace period’, during which they should conclude their speech. After this grace period is over, there will be a continuous knocking, and the adjudicators shall disregard the rest of that particular speech. Speakers continuing after the ‘grace period’ may be penalized by the adjudicators in the Method category. Debates are generally adjudicated by panels of three adjudicators, or by a single, senior adjudicator.Larger panels of either five or seven adjudicators willadjudicate the semi-finals and the finals. The ‘BestSpeaker’ of the Competition shall be determined onthe basis of overall individual points in the preliminaryrounds of the Competition. All the debaters must leave the chambers following the completion of all speeches.Adjudicators will arrive at their decisions on anindividual basis, fill in the score sheets, and pass themto the timekeeper and in the absence of atimekeeper to any pre-designated tab-roomvolunteer more commonly known as a “runner”.Adjudicators cannot confer with each other beforemarking and handing over their score sheets in anymanner whatsoever except for communicating their verdict to the chairperson once all adjudicators onthe panel have arrived at a verdict. Once the adjudicator has communicated their verdict to thechairperson, they shall be bound by the same. A majority decision will prevail for each round of the Competition. In all the rounds (except for the Round 5 and the Finals), there will be an open adjudication after thedecision for each debate is announced, where adjudicators will give reasons for their decision andother feedback to the teams. Round 5 of the preliminary rounds will be a “closed round” – that is, results will not be announced to the teams nor there be an open adjudication. Debaters should not indulge in, and adjudicators should not entertain argumentation or cross questioning,at the time of the open adjudication. A team slide is when a particular team slides onits own case. This occurs when statements made by two speakers from the same side of the house are essentially contradictory in nature. For example, consider a situation where the primary speaker says “Marijuana should be legalized only due to its medicinal values”, following which the next speaker from the same side says “Marijuana should be legalised not only for its medicinal but also due to its recreational purposes”. Here, the team has clearly changed its stance and its members have contradicted themselves, therefore sliding their case. Team slides should be marked negatively by all adjudicators. Team slides are generally not the sole reason for a team to win or lose, but this depends on the extent of the slide. Adjudicators may note that it is up to their discretion to credit or discredit a team slide. If anadjudicator is convinced that a team slide has occurred, he/she must mark down the team whichmakes the slide, and not mark up the team which points the slide out. Pulling out of the tournament – A team pulling out of the tournament is prohibited and it immediately attracts a penalty of disqualification of the whole contingent of the concerned institution,including the adjudicators. Smoking, drinking and use of drugs –Consumption of alcohol, smoking or usage of drugs on college campus is strictly forbidden by the college administration. Participants who indulge in any of the above activities must do so at their own risk. Please note that Jus Cultura, the Literary,Debating and Quizzing society will not take any responsibility to participants caught indulging in the above activities by the University or any other authorities. NOTE: Conflicts on the basis of frivolous grounds willnot be entertained. Sexual Harassment – Any incident of sexualharassment shall invite strict disciplinary action. Miscellaneous – Participants will be held liable tocompensate for any damage caused to theproperty of the University or the accommodation. Littering on campus is strictly prohibited.Participants are requested to locate and use thedustbins provided on campus for waste disposal. The rules, regulations and guidelines of thisCompetition can be amended at the discretion of the organizers. Cultura, Literary, Debating & Quizzing Society, NLIU. The teams will be put up in Hotel Abhinav Palace, Bhopal on the Hoshangabad Road with classy interiors and cordial hospitality. 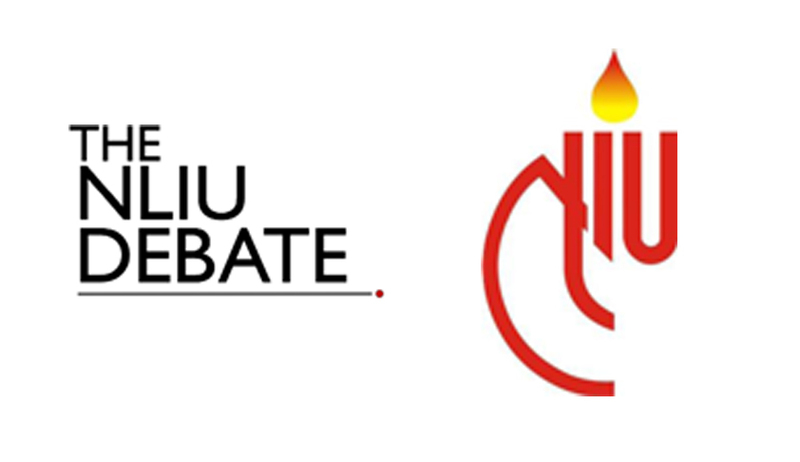 Thetransportation to and from the NLIU campus, where the Debate rounds will be held, will be arranged for by the organisers. You should also keep an eye out for the events on the break-night when you can soak your spirits and have a good time. Click here for rules, invitation, and schedule.